Admit it: You need a break from the holiday chaos. A little downtime with some music and décor ideas that will stimulate your creative side. I’ve gathered 3 festive DIY projects guaranteed to do just that. From decorative wreaths to chic ornaments, there’s a festive craft for everyone. So instead of stressing about all the shopping you have to do or all the parties you have to attend this weekend, grab a cup of hot cocoa and settle in with your crafting supplies. 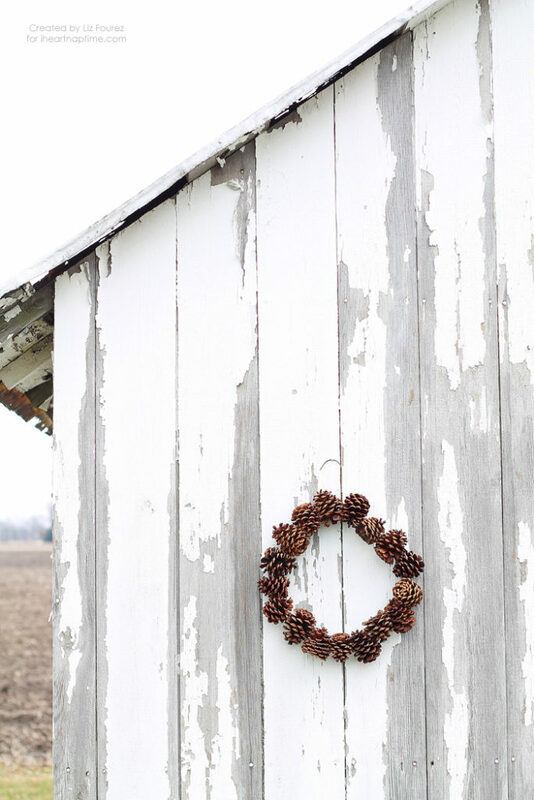 This pinecone wreath by Liz Fourez of I Heart Nap Time stood out in the sea of homemade wreaths populating Pinterest. The rustic quality and lack of greenery feels refreshing and unique. If you’re looking to add some shine to this look, add a big sparkly bow or tie string lights around it. Bend the bottom of your hanger into a circle shape. This will now be your wreath form. Use a pair of pliers to help you curve the wire, if necessary. Cut a piece of floral wire about 8″ long. Wrap the wire around a pinecone, tucking it inside the cavities. Twist both ends of the wire together, securing it tightly around the pinecone. Hold the pinecone against the hanger and wrap the remaining wire around the hanger, securing the pinecone onto the wreath. Continue adding pinecones until the entire wreath is full. Keep the pinecones close together so you won’t see the hanger in back. 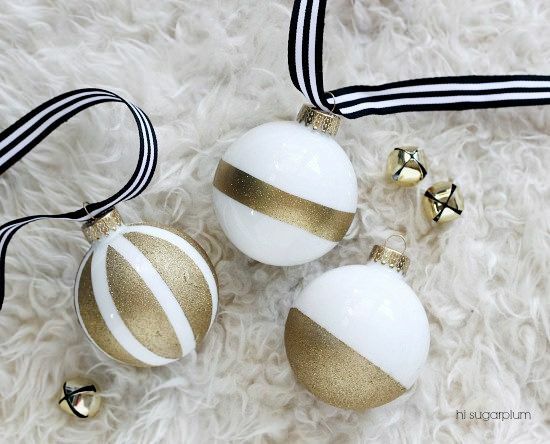 These Kate-Spade inspired ornaments by Hi Sugarplum! are the prettiest ones we’ve seen all season. These go with almost every color scheme, and white and gold is such a classic combo. All-white ornaments can feel a bit stark if not done properly, but adding a dose of gold oomphs up the glam factor on your tree. Start by cutting your painters tape into strips. Wrap the tape around the ornaments creating different shapes and patterns. Make sure to smooth the edges down completely so there’s no seepage. I found some reinforcement stickers in my (extremely organized) junk drawer, so I covered an ornament with those for a polka dot pattern. The glitter spray is actually clear with specks of glitter in it…not the look I was going for. So I gave the ornaments a quick layer of gold paint, then followed it up with the glitter spray. It really takes gold to the next level of bling! 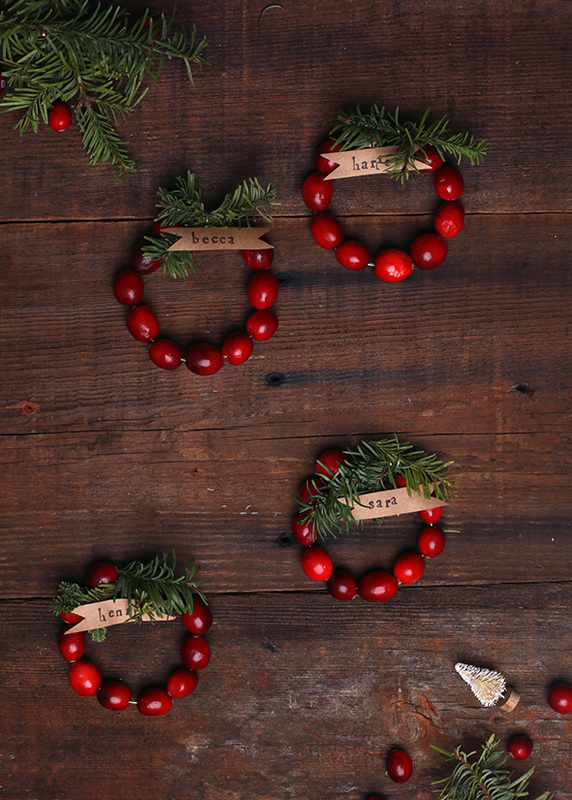 And last but not least, my favorite DIY from this roundup, mini cranberry wreath place cards by Say Yes. For Thanksgiving, I made mini rosemary wreaths, but the red cranberries will make the place cards pop so much more on our Christmas table. Another tip: invest in ink stamps! Liz Stanley uses lettered stamps to customize each place card—the perfect personal touch for any gathering. String cranberries onto wire. We used 10 for each mini wreath. Twist the wire around and then add a piece of tree trimmings in the final twist. Twist another piece of tree trimmings onto the other side, securing it with the wire. Cut out flag shaped tags from brown kraft paper and stamp names onto each one.